Langans played host the Sports Angels 4th Annual Spring Kickoff and Sports Auction on April 21, 2009 to a welcome crowd of supporters of the sports based charity. The auction was a fundraiser for the foundation, which serves non-profit community based sports programs. 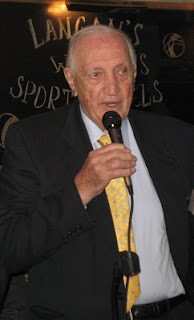 The event was hosted by former Brooklyn Dodger hurler and vice-chairman Ralph Branca. Branca gleefully thanked the crowd for coming out, updated them on the future plans of the foundation, and sang God Bless America for the crowd. The legendary Dodger discussed with us his involvement with Sports Angels. "I was chairman of the board of the Baseball Assistance Team, and worked especially with the dinner committee," he said. "When I resigned, they all resigned at BAT. We worked together for 15 years. I said, 'Why don't we continue as another charity?' We decided to organize Sports Angels three-and-a-half years ago. 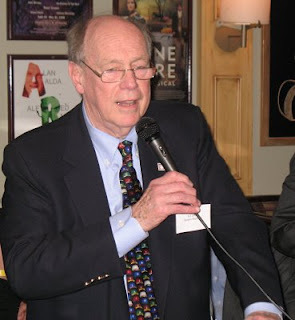 We do different venues, like what we're doing tonight, and our big dinner is on September 23rd at Cipriani's, honoring Rod Gilbert for all of his charitable work. This Saturday we are sponsoring a seminar in Peekskill, for the Lapolla Little League. They needed some help, as they're running out of money, so we bought them some equipment and gave them money to hold a clinic by the Peekskill Tides. They're going to have a dozen guys running a clinic for the Little Leaguers. As we go along, we look for other agencies we can patronize." Sports Angels chairman and former Hall of Fame president Ed Stack was there to greet the patrons and represent the foundation. Stack further explained the purpose of Sports Angels. "We aim to be involved with all sports, not just baseball," Stack said. "Our focus is to bring sports to children and adolescents that might not be able to be engaged with sports without financial help to get the tools needed to be successful. In Brooklyn, at Jackie Robinson Middle School, we helped them to get started with a baseball program by supplying the uniforms and equipment. With the current economy, everyone is affected, but we can help identify needs in the community to help." 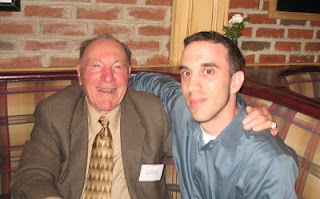 Another former Brooklyn Dodger, Joe Pignatano is also a board member of the Sports Angels foundation. Pignatano expressed that his love for helping kids is the reason he's involved with the organization. "I've always worked with kids, I love kids," Pignatano said. "Kids keep me young. It's about the kids today." He went on to talk about how Major League Baseball neglects its young fanbase and is losing out on a golden opportunity to develop lifelong supporters of the game. "I don't think baseball has done anything for the kids, nothing," he said. "All they're doing is being greedy. A family cannot go to a baseball game. That's what it is all about [the family experience]. It's a shame. Unless the family is rich, the kids can't go to the game. The teams should have ticket prices separate for families that have kids. The kids have to go to the games. Without them, baseball ain't worth a damn. That's why we're here. To help the kids." Sports Angels will have their 3rd Annual Inspiration Awards Gala on September 23, 2009 at Cipriani's Wall Street, honoring the aforementioned Rod Gilbert. More information will be provided as it becomes available. If you would like to learn more about Sports Angels, or make a donation, visit their website, SportsAngels.org.